Think about it. The guy has plenty of money, but he’s getting older. He has to be thinking to himself that it won’t be long before things like “Trump steak” will have any meaning. But, if he can become the United States president. Well, then he would have some sort of permanent legacy upon which to hang his hat. Sorry Don-Don, I don’t think that’s going to be the case. True, if you win it, you would be president, but in all reality how many of us remember many of the presidents beyond those which we encounter during our lifetime. Think you are going to magically snap your finger and a wall will be built to keep out illegal mexicans and then again to balance the current accounts deficit with China. Yea right! What you will achieve at best is infamy. But, as you have shown to date, that’s a boundary you are not at all afraid to cross. 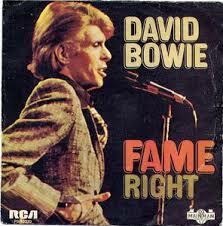 Enjoy David Bowie’s Fame [HERE].